Trending online news topics often cough up amusingly odd juxtapositions, such as when “Auschwitz” was #2 behind “LeAnn Rimes” and right ahead of “Holiday Bread Recipes” on Yahoo!’s home page. Although I didn’t get a screen capture, I swear to whatever God will listen to me that a few days ago, Kristallnacht was trending on Yahoo! amid a pack of similarly weighty topics such as Justin Bieber and Snooki. What the hell was Kristallnacht doing in the news? I won’t deny that it was horrible—I mean, especially if you were Jewish. But apparently it was trending because November 9th was the 73rd anniversary of the “Night of Broken Glass.” Only two more years, and they’ll be celebrating the Diamond Anniversary. Or the Platinum. I’m not sure. I always get those two confused. Either way—long time ago, no? Why are we still “celebrating” it? Godwin’s Law dictates that “As an online discussion grows longer, the probability of a comparison involving Nazis or Hitler approaches 1.” Godwin’s Law should be extended to include online news sites—check enough headlines, and you’ll inevitably see something about the Holocaust. It’s inescapable. When they—and by “they,” I of course mean “the Jews”—said “Never forget,” they weren’t kidding! Godwin’s Lawmen invoke their law as a sort of reductio ad absurdum argument to discredit anything perceived as even slightly to the political “right” of center. If you believe that some people in your mid-sized Midwestern city exploit their welfare checks, well, you obviously want to roast Jews alive and naked in open-pit barbecues while force-feeding them pork. To counteract its lamentably pervasive effects, I propose Goadwin’s Law: Any time someone mentions Nazi atrocities, remind them that the communists killed more people. One could split hairs on dead scalps all day and night about moral equivalencies and methods of execution, but the communists killed more than the Nazis—a lot more, actually. This is an important fact for multiple reasons, not least of which is that it makes your standard-issue pierced-nose scruffy-haired lightly bearded coffee-shop leftist who invokes Godwin’s Law 20 times daily very uncomfortable. There is joy to be had in that fact alone. 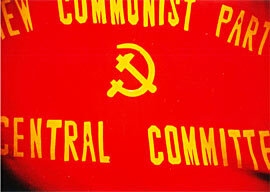 Being labeled a “commie” doesn’t carry nearly the hornet-sized sting that being smeared as a “Nazi” does, but why is that, especially if the commies killed more? On every city block you’ll see the earnestly confused irony-mongers sporting a goofball CCCP soccer shirt here, a wacky Lenin shirt there, and a solemn Che sweatshirt everywhere, but none of them would be caught dead in a Hitler shirt. Actually, the way things are these days, if anyone was caught in a Hitler shirt, they might wind up dead. For the last couple generations we’ve been brainwashed—just as when I was a kid, my mother told me the communists brainwashed their citizens—into thinking the whole hubbub about “commies” was one ridiculously overblown prematurely ejaculatory squirt of right-wing Red Scare paranoia and that the communists truly were as humane as the sheltered masses of mushy-minded American leftists had been deluded into thinking they were. That’s really a nice sentiment, but then you have to deal with “the 100 million.” Granted, 100 million is a round number—even smoother and rounder than six million—but for propaganda purposes, it’ll suffice.